Dr. Joseph Kerkula, Director, Family Health Division, Ministry of Health presenting at the CIP Kick-Off Meeting. Photo by Christine Lasway/HP+. Liberia successfully kicked off the development of its first family planning costed implementation plan (CIP) on July 24, 2017. The kick-off meeting convened over 70 key stakeholders from national and sub-national levels—including development and implementing partners, civil society organizations, and youth—to galvanize efforts around improving family planning services in Liberia. The CIP aims to operationalize the national family planning strategy in order to achieve Liberia's FP2020 commitments and beyond. The Health Policy Plus (HP+) project, funded by the U.S. Agency for International Development, is working with the Liberian Ministry of Health to develop the five-year plan; execution of this plan is expected to contribute toward the reduction of the high maternal mortality ratio (from 1,072 in 2013 to 600 in 2021) and teenage pregnancies (from 31% in 2013 to 25% in 2021). 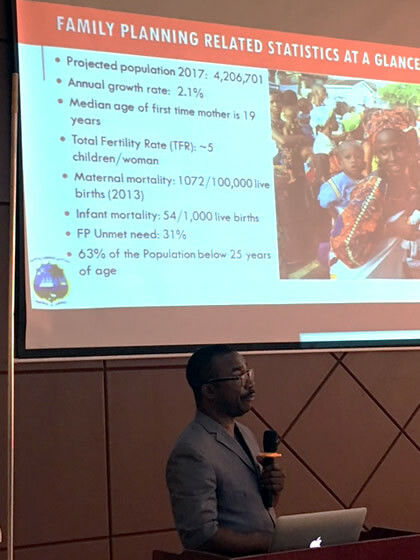 Dr. Joseph L. Kerkula, Director for the Family Health Division of the Ministry of Health said: "Identifying the bottlenecks for family planning services in Liberia is very essential in order to develop evidence-based, high impact, and cost effective interventions to address them." Liberia is one of 41 countries who have made FP2020 commitments, and in 2012 aimed to reach a modern contraceptive prevalence rate (mCPR) of 20% by 2020. At the time of commitment making, this goal may have seemed ambitious given that the mCPR was only 10% in 2007 and the country was in recovery efforts after a long-term civil war that destroyed the health system. Recent projections conducted by Track 20 and the Ministry of Health, and based on actual service data, show that Liberia is likely to have surpassed its 2020 goal, five years early. Early indications for this positively hailed outcome came about from the 2013 Demographic and Health Survey (DHS), which reported that the mCPR in Liberia was 19%, a year after the 2012 London Family Planning Summit. This report also showed that Liberia is making strides toward closing the rural-urban gap in contraceptive use and addressing disparities relative to wealth and age. However, from 2014 to 2016, Liberia was hit by the Ebola crisis, which claimed the lives of 4,400 people and devastated the health system. Stakeholders were concerned about the extent of the Ebola crisis's impact on contraceptive utilization. Track 20 analysis showed no significant negative impact of Ebola on mCPR growth—a temporary decline in contraceptive use was reported in 2014, but uptake quickly rebounded to previous levels. A planned DHS in 2018 will validate these results. While these findings show progress toward reducing unintended pregnancies, Liberia remains one of the fastest growing nations in the world with respect to population growth rate. Approximately 60% of Liberians are under 30 years of age and one in three teenagers have experienced a pregnancy. Modern contraceptive use remains low at 20% amidst slowly rising demand. The CIP presents an important opportunity for the country to bolster resources and momentum to scale up strategic efforts to meet the country's goal of increasing the mCPR from 20% in 2017 to 25% in 2022.